Subimago, the seventh full length release from Swedish duo Carptree certainly announces itself in a blaze of operatic glory, crashing keyboards, whirling organ, frantic drumming and dramatic choral work alternate with plaintive solo vocals. Both this opening track, Welcome and the name of the album itself which references a stage in the development of an insect, able to fly but not yet mature, hint at a freshness and youthful spirit. This might raise an eyebrow as Carl Westholm (keyboards, guitar, tambourine, composer & arrangements, producer & mixing) and Niclas Flinck (lead & backing vocals, composer, lyrics) are seasoned hands, backed up by their long term collaborators, the No Future Orchestra (NFO). But there is a clear design at hand, the previous outings Insekt (2007), Nymf (2010, see review) and Emerger (2017), representing earlier stages in the development of the mayfly. Now, the album artwork announces itself in a blaze of primary colours. This is music of the air, not the water, straining for the light and freedom. 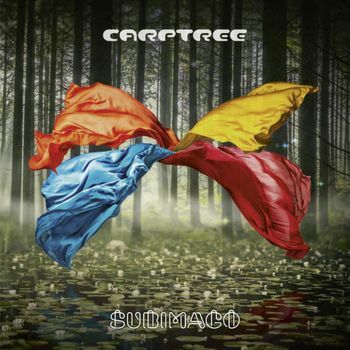 Carptree have certainly found an original seam and created a world and soundscape of their own. They pick their way through the contrasting themes in an engaging way, and with assurance. Challenging and totally individual, this is an album which repays several listens to uncover all of its charms both dark and light. This may not be the best introduction to prog rock, nor will it immediately appeal to anyone who wants to hear reruns of Pink Floyd and Genesis, but anyone who values challenging, thought-provoking and interesting modern music, with care put into the composition and delivery and a definite cerebral engagement, then this will intrigue and entertain you. The good news is that there are still stages left for this insekt to fly.